So I'm really zoning in on every variable for my bread baking to get a better crumb and ultimately a more consistent product. Right now I'm looking at controlling temperature a little better. I live in Texas, and if you don't know what that means, it means that the weather here is incredibly unpredictable. One day its 115 degrees and dry, the next day its 35 and rainy, and then the next day its 90 and ridiculously humid. I've been using my oven with the light turned on to create a warm environment for bulk fermentation but for the most part it's not super accurate and it doesn't account for my sourdough starter. With all that said I found this Brod and Taylor bread proofer (https://www.amazon.com/Brod-Taylor-Folding-Proofer-Cooker/dp/B01MEEH0SE/ref=sr_1_3?ie=UTF8&qid=1525443453&sr=8-3&keywords=brod+and+taylor) and was curious if anyone has tried it or has an opinion on it? I would totally drop 150 bucks on this if anyone has had good experience with it. Either way, whether you have tried it or not, I would love to read some thoughts on this. People that I know that have it think it's a great product. The Proofer has been calibrated for a room temperature of 65-70 °F. The Proofer is only designed to warm its contents, not cool. If the room temperature is above the set point, the Proofer cannot be cooler. If the ambient is very cold – lower than 55 °F / 13 °C, the temperature setting may need to be adjusted a few degrees higher to achieve the desired result. Good point...I assumed the OP was trying to warm the air above what the air conditioner provided. I keep my house at around 75 in the summer and this is a pretty optimal proofing temperature. Yes, you can proof *faster* in a warmer environment, but faster usually means inferior bread. The only time I try to speed my proofing is when I've miscalculated and need the bread done in time for an event. Whenever I'm home baking bread it's usually about 72 degrees in the house. So surely this could still help? Maybe if I put an ambient thermometer in the actual brod and taylor at all times so that I can adjust it's heating percentage? My home is always at 72F. The only thing that matters is your indoor temp. Our outside temps here range from 0F in winter to 85F in the summer, my indoor temp is always at 72F. Yes, it will work perfect. Forget the thermometer and percentage, just set the temp control on the B&T. You'll love it. It is invaluable for me. I have owned one since they first came out. It has given me no problems. I even keep my starter in it when the weather is cool. I wouldn’t want to be without it. Oh, check at Bed Bath and Beyond. I think 5he price is the same, you get free shipping, and you can find a 20% off coupon. I love my proofer, more consistent results since I bought this. One hint, i would buy it direct from brod and Taylor, their customer service is fantastic. Here's a review of the proofer. Yeah, I love it too, but I live in a much cooler climate than you. I absolutely love mine, although I will confess that I rarely use it for bread-making purposes. I live someplace very hot and humid, so my indoor temp (even with the a/c on) is typically around 78 degrees. 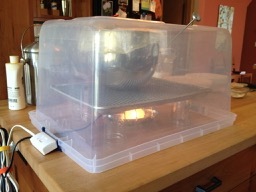 But I use the proofing box for making yogurt, air drying cheese, and making tempeh! It's a very versatile appliance, and folds away easily and pretty small. I managed to get a used one from Amazon marketplace for about $110, so if you can be patient, deals do come along periodically! I have used mine for years and love it. It offers a humid environment or a dry environment and constant temperature. I like the design that allows it to fold up for easy storage into a narrow width. It also offers the correct temperatures if you are into cheese or yogurt making. My goat cheese and paneer/ricotta cheese turn out nicely as well. Thank you everyone for all of the info. Based off some of y'all responses and a lot of research I decided to go ahead and get one and I'm sooooo glad that I did. So far I've baked two loaves and they were so incredibly consistent. The target dough temperatures, levain ferment, and bulk fermentation times were spot on. My dough was so bubbly and happy. Can't wait to continue using this wonderful device. Thank you again!!! Good for you! One of my favorite appliances.